I had an idea a while back for a website. I’ve actually had many, but that’s besides the point. This idea was one that would aggregate all of your online happenings and make a single feed for it. Reading TechCrunch over the past couple of weeks, and article as posted about FriendFeed. I immediately found the site that I had been looking to make, if I ever had the spare time to do such a thing. If any of you are interested, you can see my Friend Feed at http://friendfeed.com/rprins. Pretty neat, it’s like Facebook’s MiniFeed, but for everywhere I visit. Got this in an e-mail today and I figured I’d post my responses here. Not going to subject people to this. Seattle from Kerry Park » Originally uploaded by rprins. Today was really nice out in Seattle. The sun was out and it was in the mid-50s. 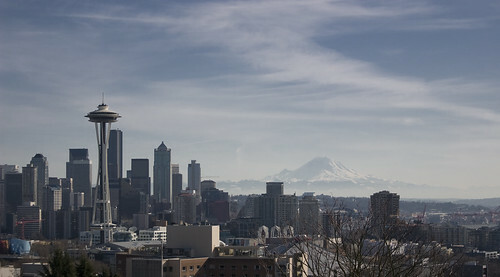 I decided to head out to Kerry Park and Gasworks Park to take some photos since the day was so nice. In this one we’re lucky enough to see downtown and Mt. Rainier in the same shot. You can see more photos from the day in this Flickr set. Taking a nod from kottke.org, here’s a listing of the cities I visited in 2007. I spent at least one or more nights in each city. Those with an asterisk (*) I visited multiple times on non-consecutive trips. I’m sure that Jamie will have a list that will be at least twice as long as mine. But, that’s OK, I can take it. Ever wanted to know what things interest me in the blogs that I read? You should check out my Google Reader Shared Items page. Lots of good stuff there that gets updated multiple times a week. I’m in Eden Prairie for the next five days. My vacation has officially started. What I found actually shocked me. It costs me on average $1.23 to drive my car 1 mile. If you remove the 1st month of car payments (which includes a hefty down payment), it averages around $1.00 to drive 1 mile. I want that to be on its own line since it is kinda shocking. That is more than double what AAA says the national average is. So, where I had said it only costs me $3.50 to go to and from work was completely inaccurate. It actually costs me $29.52 to drive to and from work each day. It’s pretty incredible that it costs that much. But, even if I took the bus to work each day, my costs wouldn’t fall to zero. I have fixed costs to keep my car running. I still need to pay my lease, insurance, and gas costs. In addition, I may save out on an oil change or two, but since my lease on my car has less than two years left, I would bet that I’d only save out on one oil change. The next thinking is what would I actually save if I didn’t drive to work at all. For me this is not completely real world, as of yet, but I want to see what it would be like if I didn’t drive to work at all. I would save 552 miles on my car, and roughly $96 on gas. If I drove half of the month and bussed the other half I’d drive only 324 miles (I’d still need to drive to and from a location where I can catch a bus) and gas would cost me $56.54. That’d save me $39.79 a month. If you increase the public transit ridership even more, lets say, to three days a week. I’d only drive 240 miles and gas would only cost $41.88, saving me $54.44 a month. Needless to say, I can play with the numbers all day, but the point is that I learned a lot by doing this exercise. When I got out of school I was pretty excited to get a car to drive that I didn’t pay particularly close attention to what it actually costs to drive it every mile. Granted, if I drove my car more, I’d get better cost per mile averages. However, for me, that isn’t going to change in the short term and I’m afraid that I’m stuck with the average that I have. If you own/lease a car and you are curious on what it costs you to drive it a mile, I really encourage you to take the time and figure it out. What you find will no doubt shock you, as it did me. Driving to a location near the bus stop and taking the bus to work. There are definitely logistics that need to be worked out on all ends for the top two options and I’m looking into how all of this could work out. I don’t know if this is going to change my habits, but it makes me more aware of what it really costs to drive my car and it has forced me into looking at alternative ways to drive to and from work.